In 1863 Jean-Baptiste Camus founding a collective of producers that produced high quality Cognac under the name La Grande Marque. The business flourished and soon enough Jean-Baptiste bought out his partners to establish his own Cognac house, Camus La Grande Marque. The name gained fame, they even started supplying the court of the Russian Tsar Nicolas II. Cherishing this 150 year-old tradition, the 5th generation of the family remains true to the heritage of providing different and intriguing Cognacs from all the Terroirs. Bois Ordinaires is the smallest of the six crus and the vicinity of the sea brings it a different character, full of fruitiness which, in the past, was overlooked but had now obtained recognition with new approaches of making Cognac. Camus Ile de Re Cliffside Cellar is unique in the World of Cognac. For one, the grapes have a higher iodine content because of the vicinity of the sea, and secondly, the maturation uniquely occurs on an island encircled by the Atlantic. This is a one-and-only infusion broadening the Cognac universe. 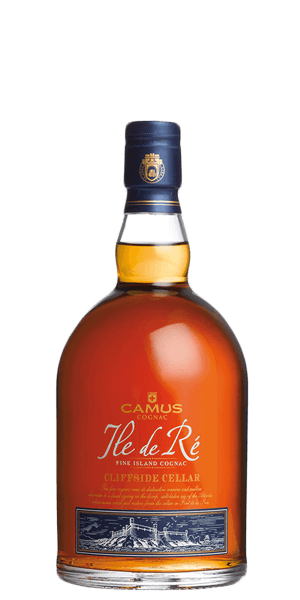 What does Camus Ile de Re Cliffside Cellar taste like? The Flavor Spiral™ shows the most common flavors that you'll taste in Camus Ile de Re Cliffside Cellar and gives you a chance to have a taste of it before actually tasting it. The smell of the sea in combination with oak and a bit of smoke. A pleasing palate of vanilla and smoke with layers of citrus and sweet floral flavours. Full of different layers that dance around for quite some time, some rancio is also present. Oak, Sweet, Salty, Vanilla, Floral, Damp, Spicy, Grapes, Toasted, Citrus, Orange, Caramel, Dry, Iodine.